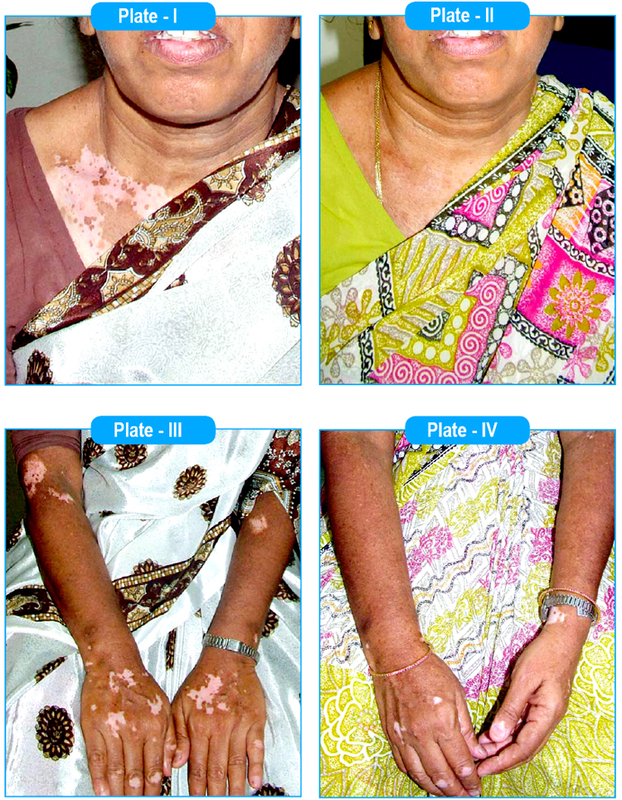 A female aged 45 years presented white discolouration of skin since three years. The white lesion appeared first in the right fingers and extended over fore arms, chest abdomen and legs. The lesions were larger in size the periphery is continuing the hypo pigmented patches and the lesions were larger in some of the places. Had been hospitalized for Typhus fever for fifteen days Underwent radiation for suspected carcinoma of mammary gland five years back No H/o insect bite, worm infestation, blood transfusion. Initially tried with modern medicine, oral and topical applications not benefited. Blisters appeared on the applied parts. She tried siddha treatment for some one year, treated with oral and topical applications with exposure to sun light in the morning. • Food Type - Non Vegetarian.Has the habits of taking tea, coffee. Mental, intellectual state of mind is irritable, anxious, very sensitive and emotional, Mood changeable, Depressed and worried much about her illness. Attained menarche when she was 15, had regular periods with flow, and attained menopause when she was 40 years old. Married, 2 daughters, had abortion once when she was 30 years old. After schooling got married and lived happily with her husband and two daughters. She gave good education to their daughters, employed and married, lives happily. Two years back her husband passed away due to cardiac arrest. Now lives alone. Mixed miasmatic state, Dominant miasm is Syphilis. The patient visited every 15 days; on 15/4/2012 she showed some black spots in the affected area and worried on the extension of the discolouration. She continued the treatment once a month, almost 80% of the lesions was better. Ars Alb 1m is still prescribed every month and gradually improves. (Refer the plates I, II, II and IV). The patient was prescribed understanding the miasmatic background of the disease. She had typhoid, which could have emitted toxins, which later could have produced the auto immune reactions. Radiation for Ca is an attributed factor. The psoric manifestations of the cell had quickly shown with destruction of melanocytes, an understanding of pseudo psora, which later entered syphilitic in the chronic course of the disease.